We want to care for our members, visitors, and community. Our pastors are available to you, we will pray for you, and we have many other services to care for your emotional, spiritual, and physical health. “For I was hungry and you gave me food, I was thirsty and you gave me something to drink, I was a stranger and you welcomed me…” Matthew 25:35 NRSV. Myers Park is active in ministry locally, nationally, and globally. From our first Sunday in 1925, when the opening hymn was All Hail the Power of Jesus’ Name, Myers Park United Methodist Church has remained of one accord and one mission, that being to praise and serve God. Want to learn how you can serve with our scholars and interns by coordinating snacks, planning celebrations, sharing your talents through classroom activities and more for 2019? Contact Susan Scott at sgsphotography@gmail.com. More details to follow soon. [Mark your calendar for our Freedom School 2019 dates of June 17-July 25 (note: no Freedom School on July 4 & 5)]. Read with one or two elementary aged children to help improve their proficiency, comprehension and love of reading. Provide an extra set of hands on a field trip to Discovery Place, Ray’s Splash Planet, Bowling, CPCC Theater and more. Plan or assist in a 45-minute activity to share with one or more classes (10 scholars per class). Ideas include knitting, crafting, basketball skills, bubble making, outdoor games, but possibilities are endless. The Freedom School Curriculum requires various purchased craft and enrichment supplies week to week. Shop from a requested list. Expenses reimbursed upon request. Help us show classroom interns and site staff our gratitude in a myriad of ways with prayers, treats, notes, lunch, gift cards and more. Provide homemade/healthy snacks for our 80 scholars. Popular nut free choices include cookies, fresh fruit, ice cream sandwiches. Our 12-13 interns and staff meet for debrief at the end of each weekday and greatly enjoy a special treats such as popsicles, cupcakes, chicken minis, chips and dip and more. Deliver both scholar and intern treats to our Freedom School Site at Marie G. Davis most weekdays from 8:00-3:00. 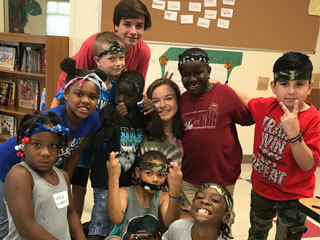 Help assist with various Freedom School special events throughout the summer, including MPUMC Freedom School Sunday, Intern welcome lunch, our year-end Finale celebration. Be an extra set of hands or engage friends and family to coordinate these and other one-time celebrations. We'll email you church announcements, inspirational messages, and mission updates.